In “Where a Death Certificate Can Lead,” we showed how you can use the census and city directories to learn more about the spouse and children of a deceased ancestor. We were able to identify the children of Joseph Barnett from census records, and we used a city directory to locate his daughter, Janie, and her husband. Hopefully, you also submitted the records you were able to find using the death certificate. We will now discuss other details on a death certificate that could make your genealogy come to life. On a death certificate that has been completed in full, you will find the place of burial and the funeral home. Look closely at the death certificate below. Where does it say that Benjamin Singleton is buried? 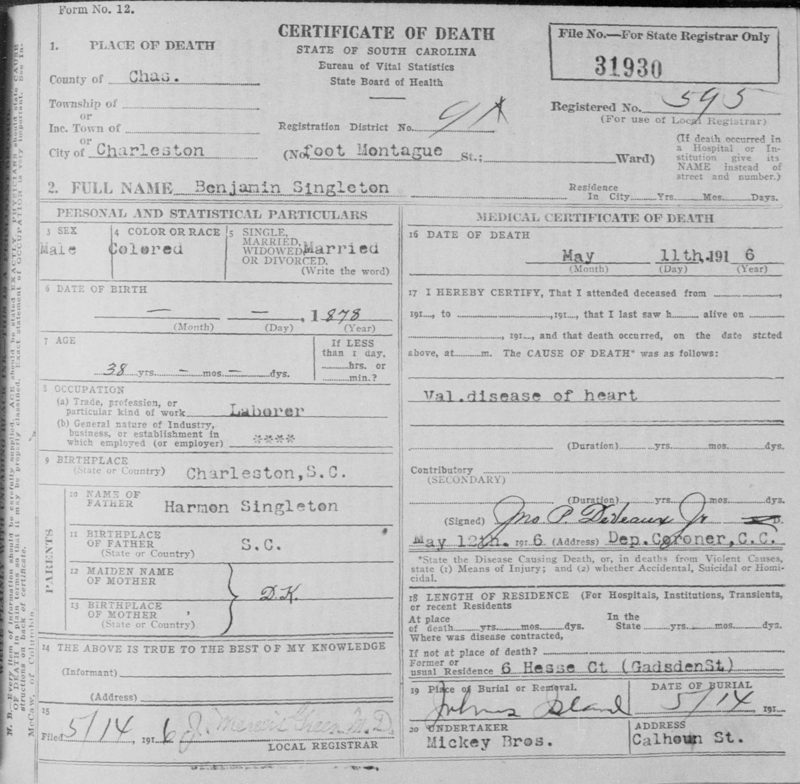 Death Certificate of Benjamin Singleton, 1916. “South Carolina Deaths, 1915-1943,” database with images, FamilySearch (https://familysearch.org/pal:/MM9.3.1/TH-267-11616-45607-21?cc=1417492 : accessed 21 February 2016), 004176928 &gt; image 529 of 1657; Department of Archives and History, State Records Center, Columbia. (Answer: John’s Island) Not knowing the specific cemetery makes it difficult. What funeral home or director did the family use? (Answer: Mickey Brother’s on Calhoun St.) Well, if you do not know the local history, chances are you do not know that Mickey Brother’s Funeral Home merged with Harleston Funeral home about 1901, and the name became Mickey and Harleston Funeral Home until 1913, when a new funeral home was established under the name Harleston Funeral Home. So now you know the actual name of the funeral home for Benjamin Singleton at the time of his death in 1916. See Harleston Funeral Home. You may be wondering what you could possibly use that information for, but consider for a moment the possibility that you could discover that the funeral home that provided the final arrangements for your loved one kept a file on your ancestor. What might you expect to find in that record? Sometimes the place of burial is not filled in on the death certificate, or only the county or state is listed. This is a researcher’s nightmare because that makes it more difficult to narrow down a cemetery. Another benefit of knowing the funeral home and the cemetery is that there may be a strong possibility that more generations or other extended family members may have also used the same funeral home or were buried in the same cemetery. That means you can widen your search by walking the cemetery to look for more graves for your family or you can ask the funeral director if there was a possibility they took care of the parents or siblings of your ancestor also. 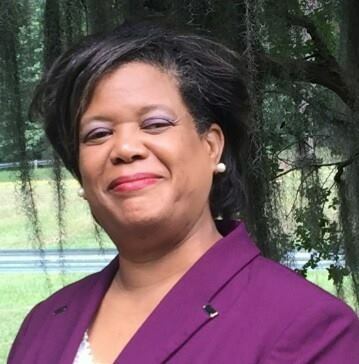 Challenges that you may face are that the funeral home may no longer exist, or the cemetery may have been destroyed or overgrown making it impassable. If this is the case, you will need the help of local historians to identify who may have the remaining records of the funeral home or cemetery. Start by asking the existing funeral homes and cemeteries. To learn more about cemeteries, check local newspapers and city directories. If your family used Harleston Funeral Home or Mickey’s Funeral Home, you will want to research where and how to access those records. Please remember that when you approach a place of business, you should make an appointment and offer to look carefully through records they give you access to. They most likely will not be able to provide the time or staff to research for you. To learn more about cemeteries, check local newspapers and city directories. Pick a death certificate for one of your ancestors. Extract the name of the place of burial and the funeral home used. Find out what record the funeral home has for your ancestor. Then find out if any other family members are buried in the same cemetery. Come back and share what you learned in the comments section below.